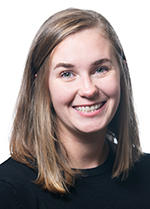 Jessica joined the Advanced Lighting team at PNNL in March 2019 as a Post Masters Research Associate. Prior to joining PNNL, Jessica worked as a lighting designer in New York while receiving her Masters from Parsons, The New School. Her Masters Thesis “Perception of Metrics: The Intersection of Color Characteristics and Quality” examined the relationship between LED light source performance metrics and subsequent human perception. Jessica is working to develop a database that can aid consumers in the selection of a light source by correlating lighting metrics to familiar language. Her current research is focused on emerging SSL technologies, their associated metrics and suitable applications.